BORN: Toronto, Ontario, Canada, February 23, 1972. Selected by Minnesota North Stars in fourth round (second Minnesota pick, 74th overall) during National Hockey League entry draft, June 22, 1991. Minnesota franchise transferred to Dallas, Texas, and renamed "Stars", June 9, 1993. Traded by Stars to Washington Capitals for cash, July 14, 1995. Traded by Capitals to Mighty Ducks of Anaheim for F Todd Krygier, March 8, 1996. Named to Memorial Cup All-Star Team, 1990. Winner, Hap Emms Memorial Trophy, 1990. 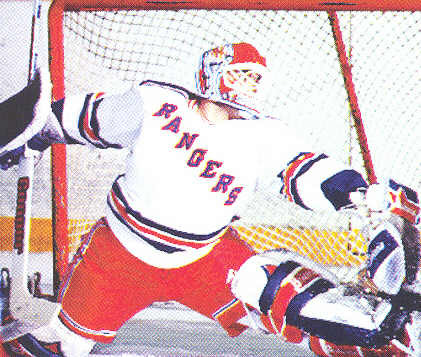 Named to Ontario Hockey League All-Star First Team, 1990-91. On October 22, 1999, while with the United Hockey League's Mohawk Valley Prowlers, Mike scored a goal. Selected by Minnesota North Stars in National Hockey League entry draft, June 22, 1991. North Stars franchise transferred to Dallas, Texas, and renamed "Stars", June 9, 1993. Traded by Stars to Washington Capitals, July 14, 1995. Traded by Capitals to Mighty Ducks of Anaheim, March 8, 1996.